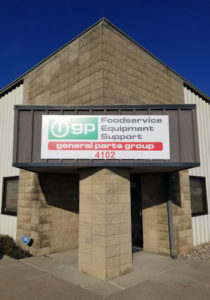 For your repair and maintenance needs in the North Central and North Eastern area of Indiana, General Parts Group’s service division, GP-ServiceDirect, located at 4102 Merchant Road, Fort Wayne is here to help. Our factory-trained and industry-certified technicians can handle any service or repair you need, including: ware-washing equipment, refrigeration units, HVACs, commercial cooking equipment, and food preparation equipment. When it comes to commercial appliance and restaurant equipment repair, our service experts have you covered. For more information contact us at (855) 266-6250 or email INDispatch@GP-ServiceDirect.com . Need assistance after hours or on a holiday? No problem! Our Emergency Repair department is always available 24 hours a day for repairs. Your kitchen will never be down for long with our experts at the ready. Our knowledgeable technicians are qualified for any food equipment service and maintenance you have, from floor to ceiling. We backup all of our repairs with a 90-day labor warranty. The experts at Fort Wayne can also install almost any commercial appliance, no matter the brand. We know you have a business to run, so we also offer flexible scheduling to minimize disruption to your workday. We’ll install at a time that works best for you. We inventory a wide selection of O.E.M. parts for most major commercial appliance brands that our technicians utilize in their repair calls. If you prefer to fix it yourself, you’ll find what you need on our online Parts Store GP-PartsDirect.com. Pick your part up at our Fort Wayne location, and ground shipping is free. Need to protect your investments? One of the most beneficial services we offer is a routine maintenance plan customized for your unique needs. Maximize your return on investment with equipment that works longer and more reliably with regular planned maintenance visits. Not only do we provide flexibility when scheduling any service, during and after hours; all of our services are backed with a 90-day labor warranty. At your request, we can also keep you updated on our progress during our service calls. We’ll use our Automatic Status Update System to send you emails throughout the service so you’re never in the dark on our progress. Your account information is at your fingertips when you need it. Our client portal holds all information that pertains to what you have asked us to do, such as open orders, closed orders, service history, etc. Click here to request access.